It is interesting how 90s or early 2000s’ Hindi music comes with significant anecdotal value. Even as they are played out of random taxi stereos or on one of those 90s-obsessed radio channels, there are umpteen memories that run past our minds. Something on similar lines, I remember observing this shop owner near one of my previous workplaces. He played the title track of Tum Bin and the frequency was notably surprising. On an average of 3 days a week, I used to hear this song play out of his desktop computer in not-so-distracting volume levels. Somewhere I was sure that he played it on other 4 days too and I will blame it on my erratic timings. One fine day I decided to assume to be a passer-by customer (and the song was about to end as I stepped in). As I walked out, I casually quizzed the guy on what appeals so much to him in the song. Predictably enough, he turned out a little talkative and proclaimed how it reminded him of ‘someone special’ who is no more around. He reiterated how the voice seems to come straight from the heart, not from a metallic device. Simple, to-the-point rationale that sufficed why the song remains evergreen till date. As I observe Hindi music industry today, it carries zero traces of its illustrious legacy of non-film numbers. Songs with strong melodic bases are far and few between and that’s where I can’t resist stating how the listeners of today doesn’t deserve a talent like K S Chithra – who is still on top of her game in South India. Or for that matter the majestic line up of playback singers and performers like Sonu Nigam, Udit Narayan, Kumar Sanu, Alka Yagnik, Kavita Krishnamurthy, Shaan, KK, Sanjeevani, Jaspinder Narula and others who face profound neglect. No, I am not stuck in the 1990s but these are voices behind songs that find love and patronage till date. 90s’ throwback is no joke, for starters. Songs from the preceding eras never really enjoyed the kind of nostalgia value these songs do today. Even more heartbreaking is how today’s vocalists with their limited talent and shortlived success breed worries on how a blogger ignored them on a red carpet, or how there isn’t ‘female’ equivalent for Arijit Singh. To each her own, I say. Anyhow, I will keep sarcasm for a later date and would rather revisit a bunch of K S Chithra melodies in Hindi and Urdu – some popular, some overlooked – that have enchanted us in the past. A sensation in South India, Chithra made her grand entry to Bollywood with South Indian producer Suresh Krishna’s Salman Khan – Revathy starrer Love. ‘Saathiya Tune Kya Kiya‘, anyone? The song and the album featuring the hit vocal pair of the era, Chithra and S.P. 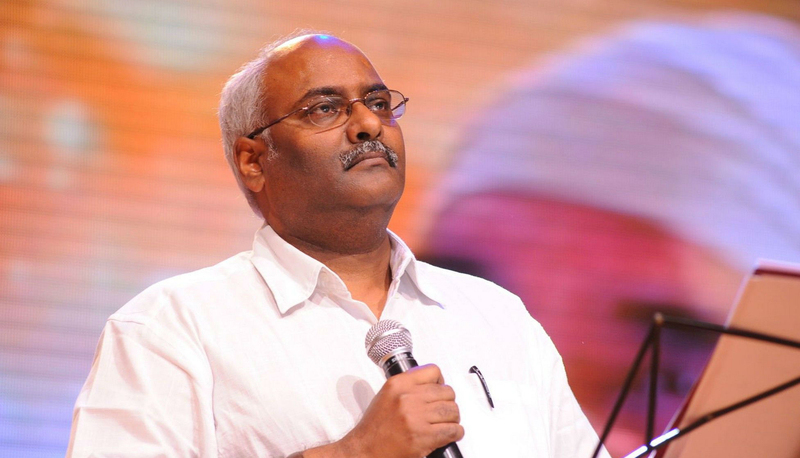 Balasubrahmanyam, became hits and composers Anand-Milind saw their stocks rising. The song was later used in Mahalaxmi Iyer’s voice to pay tribute to Revathy who was making a comeback with 2 States. Chithra’s rise in Hindi music scene was exponential with AR Rahman storming Indian music scene with Roja. The honeyed Yeh Haseen Waadiyan from the soundtrack is a regular on television and radio channels. 25 glorious years and an album as fresh as bunch of English daisies. Rahman, I tell you. On a different note, here’s a rare RD Burman song by Chithra and Vinod Rathod. 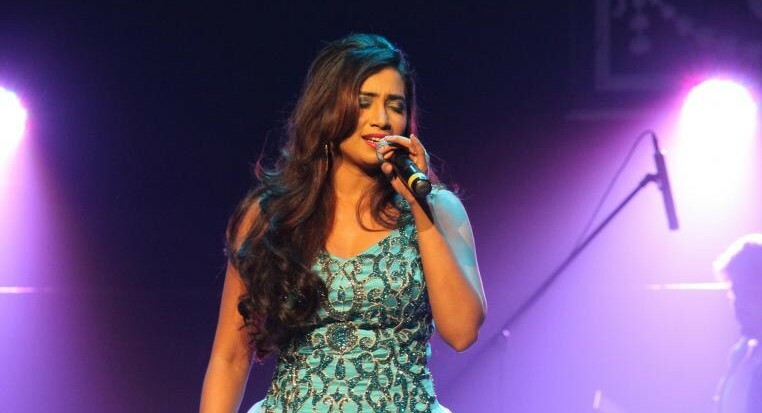 One thing I take pride in is in the fact that my (personal) favourite musicians from Bollywood were the ones to utilize Chithra’s voice to optimum in the industry – A R Rahman, Anu Malik and Sandesh Shandilya. Having worked with her during his days as an instrumentalist in Chennai, A R Rahman hiring her for his compositions never came as a surprise. From the angelic Kehna Hi Kya (Bombay), the National Award-winning Ooh La La La (Sapnay ­– award was for its Tamil counterpart) to the peppy Yaaro Sunlo Zara (Rangeela) and the operatic Jaage Hain Der Tak (Guru), their association in Hindi is one for keeps. For Anu Malik, the process seemed more organic. A favourite with Telugu producers, Chithra was recommended by South Indian producers in their frequent Bollywood outings. 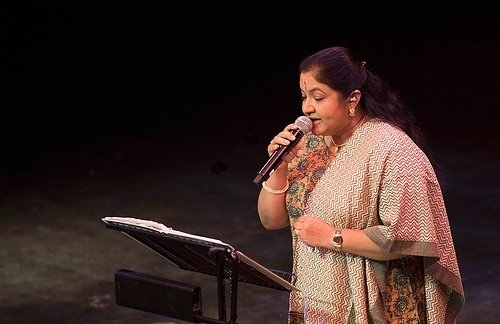 In one such association, Chithra made two songs with Anu Malik in Haathkhadi – including the coquettish Jawaani Mein Aag. Soon they collaborated in the remake of Tamil/Telugu hit Sooryavansham wherein Malik recreated one of Chithra’s hit numbers as Dil Mere Tu Deewana Hai. The duo eventually developed a work chemistry and went on give gems like Raat Ka Nasha (Asoka), Hum Bhool Gaye (Aks) and the National Award-winning Payalay Chunmun Chunmun (Virasat). Malik eventually gave her an entire album in Rajshri’s much-hyped Kareena Kapoor-Hrithik Roshan-Abhishek Bachchan vehicle Main Prem Ki Diwani Hoon! Songs that possess incredible shelf life, we only wish the actors saved their priceless expressions for a different film. Sandesh Shandilya, a disciple of Ustad Sultan Khan, explored Chithra’s immense versatility in his 2000 album with Khan titled Piya Basanti. A runaway success, the album remains the biggest Indipop hit for all parties involved. In later years, Shandilya used her voice in Uuf Kya Jadoo Mohabbat Hai and Agnivarsha among others. It is also interesting how composers Dilip Sen-Sameer Sen forged an interesting union with her in Guddu Dhanoa directorials (Ziddi, Salaakhen and Aflatoon) all of which had Chithra hogging the audio inlay cards. ‘Hum Tumse Na Kuch Keh Paaye’ reminds me of how Chithra showered her expertise in aalaps onto Bollywood as well. 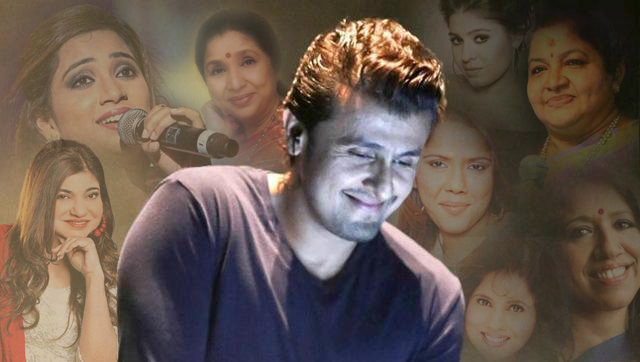 It is notable how post the solo reign of veterans Lata Mangeshkar and Asha Bhosle, Bollywood tried to manifest their female vocals differently. There were increased number of item numbers, suggestive expressions and in-your-face lyrics. Subtleties, details and improvisations generally attributed to classical forms of music paved way to massy, saleable propositions. Barring exceptions in Raja Hindustani, Mohra and few others, hummings were showly going extinct. Chithra, whose aalap’s were a rage down South made full use of her classical expertise in her Hindi music career. If you notice her debut number Saathiya Tune Kya Kiya (Love), Tu Maange Dil (Aflatoon) or Tu Mile (Criminal), there were segments reserved for her luscious hummings. Far, far away from stereotypes…. Being versatile came easily to Chithra, as a reason of which she never really got slotted into a certain category. While she added the right shades of melancholy to compositions as Tum Bin (Tum Bin) and Raat Hamari Toh (Parineeta), Chithra didn’t stop being super-sultry in Asoka’s Raat Ka Nasha or spunky-sensuous in Armaan’s Mere Dil Ka Tumse Hai Kehna. Koi Mil Gaya’s regular heroine tone was mere cakewalk for her, as was Zakhm and Filhaal’s lilting lullabies. Chithra is from the generation of singers who rever the stage and the microphone. Every time I attended a concert of hers, I would see her pay respect to the stage as she entered. This is the generation that could never think of autotune or create hoopla by lip syncing to their own songs. Also frequent are her concerts for the less privileged, the proceedings of which go to their respective welfare funds. Plus, no concert of Chithra is complete without an impromptu encore session wherein she takes requests from all and sundry. Here are some of my favourite stage performances in Hindi language and it’s startling to see how her admirers respond in the comments section. If you were a 90s kid, you would know how Indipop numbers became part and parcel of your lives. Chithra was quick to join the bandwagon with a relatively low key debut in Ragga Raaga with Voodoo Rapper. Composed by Salim-Sulaiman, this album features Chithra as a fortune teller in the music video. Chithra eventually joined the elite club by cutting the album Sunset Point with Bhupinder featuring poetry and lyrics by Gulzar, set to tune by Vishal Bhardwaj. A gold-certified album Piya Basanti also featured an array of songs that showcased Chithra’s versatility further. The folksy Surmayee Aankhen with a Nepali prelude is not only a gem of a number, but also gives a closure to the abrupt way the title song ended like. Later in the decade, Chithra cut a ghazal album Kehna Hai Maine Yaad Kiya composed by Afsar and Sajid. A bouquet of five solo numbers, the album showcased the singer’s vocal perfection yet again. She further proved her fondness for ghazals as she collaborated with Pandit Ramesh Narayan for another exclusive album Andaaz which offered serene melodies as the one below. If at all you are looking for an icing on the cake, here’s Chithra’s lilting duet with A R Rahman in the latter’s album from 2013 – Raunaq! 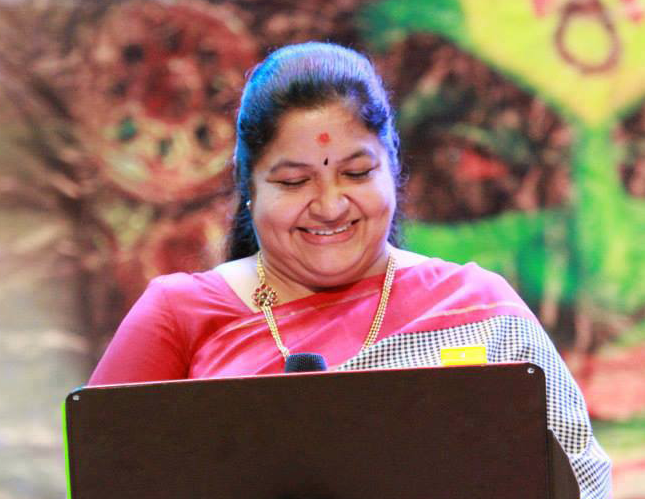 Most of Chithra’s fans are well-aware of her international ventures that are far and few between. What came recently as a pleasant surprise was her song for the famous Pakistani TV show Bholi Bano. A simple romantic number with great emphasis on expressions had the listeners from Pakistan in awe. If I were to make a wish on Chithra’s 54th birthday, I would make one for a magnificent return to Hindi music scene. Even it happens to be for a single melody, it will totally satiate her Bollywood fans for years to come. Well written. Bollywood has never showed any interest in promoting singers from South while we have welcomed them with open arms. KJ Yesudas, Vani Jayaram and KS Chitra are victims of filthy politics. Previous Post“Mom” – A ‘No One Killed Jessica’ meets ‘Kaabil’ revenge saga that is up for no good!